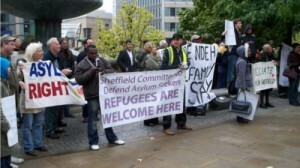 Sheffield CDAS is a campaigning organisation opposed to the government’s scapegoating of asylum seekers. We support groups campaigning for individual asylum seekers and families of asylum seekers who are unjustly threatened with deportation. for asylum seekers to have the right to work and entitlement to income support. for detention centres to be abolished. to defend the 1951 Geneva convention. for an end to dispersal. for full legal rights and representation. for an end to the asylum and immigration act. Please sign the petitions and get involved with our campaigns!